Fancy a nibble, then choose from a selection of snacks on offer at the SnackWall. These snacks are not your typical bar snacks, we’ve sourced for quality and even an authentic taste of Scotland. This of course doesn’t make them cheap, but we’re sure once you taste them you’ll know why they are worth every cent. 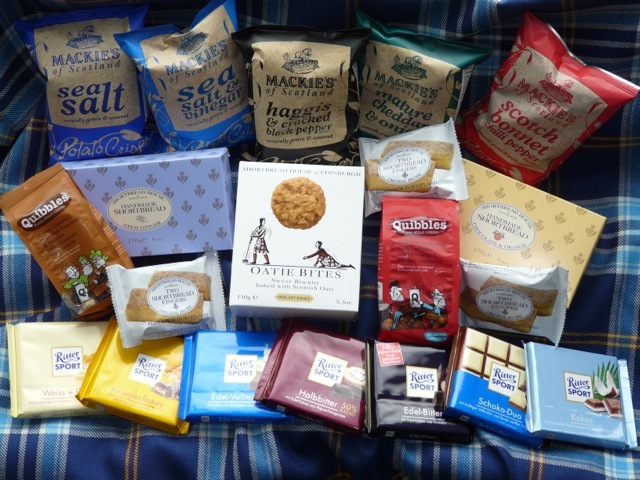 So go on why not try a taste of Scotland and grab a bag of the acclaimed Scottish hand-made crisps from Mackie. Don’t be affraid of “Haggis and Pepper” flavour it’s truly a taste experience of Scotland. And are you brave enough to also try the Scotch Bonnet? We also have the award winning House of Edinburgh Shortbread, this stuff tastes like it should, handmade deliciousness. It’s well worth buying a box to share over coffee at lunch-time with friends or even to compliment a malt whisky. All snacks on the shelves can be purchsed directly using the self-service checkout desk using your i-Button. Yes we use to have chocolate, but the crisps are more loved so now we have more flavours on offer such as bacon and flame-grilled Aberdeen Angus Beef.